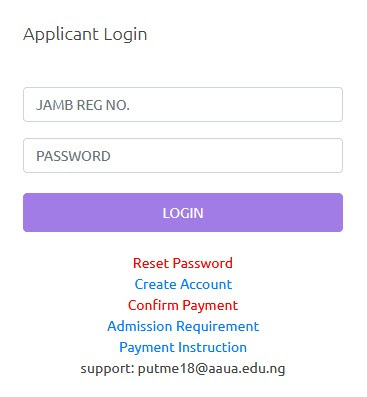 If you’re on this page when the post UTME registration is still in progress, you should read guide to apply for the screening first. If you’ve applied but want to print your exams schedule or want to print your exams result follow the steps below. Your exams schedule will be prompted for download. Download and print. This will be required to enter for exams. Note that, you will need Adobe Reader or PDF Reader to view and print your slip. Exams will start by Monday, 3rd September 2018. Follow the same steps to check your result. Adekunle Ajasin University, Akungba-Akoko Postpones 2018/2019 POST UTME SCREENING EXERCISE. This is to inform all candidates for 2018/2019 Post UTME that the screening exercise has been postponed till next week from Monday 10th to Friday 14th September 2018. New dates for respective candidates will be communicated to them. It has been so difficult to generate another RRR no to pay the balance of my daughter school fees after paying the 1st installment of #50,000.00 as part payment. How can i generate RRR no to pay the balance?